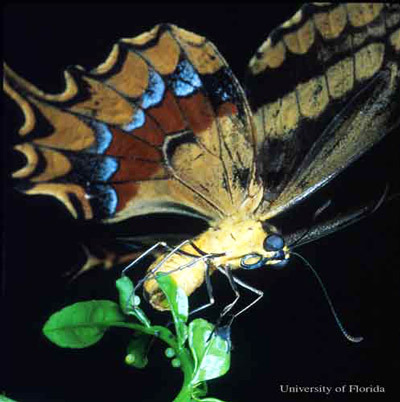 The Schaus swallowtail, Heraclides aristodemus ponceanus (Schaus), is a large brown and yellow butterfly endemic to Florida; additional subspecies occur in the Bahamas, Hispaniola, and Cuba. The butterfly is restricted to intact tropical hardwood hammocks and their associated margins. 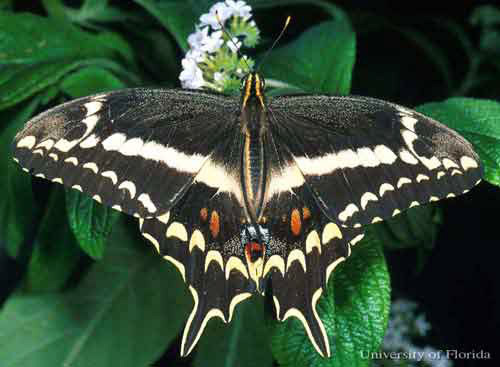 The Schaus swallowtail was listed as a federal threatened species on April 28, 1976. It was reclassified as a federal endangered species on August 31, 1984, following several years of additional population declines. Current population estimates range between 800 and 1200 individuals. It remains the only federally listed butterfly in Florida. Figure 1. Adult male Schaus swallowtail butterfly, Heraclides aristodemus ponceanus (Schaus). Photograph by Jaret C. Daniels, University of Florida. The Schaus swallowtail is found only in Florida. It historically occurred from the greater Miami area south through the Florida Keys to Lower Matecumbe Key (Miami-Dade and Monroe Counties) (Klots 1964, Minno and Emmel 1993). It is currently restricted to only a few remnant tropical hardwood hammock sites on the south Florida mainland (the Deering Estate at Cutler), northern Key Largo, and several small islands within Biscayne National Park. Adults: The adults have a wingspan range of 86 to 130 mm. Females are generally larger than males. The sexes are similar although males have yellow-tipped antennae. The upper surface of the wings are brown with a row of yellow submarginal spots and a broad yellow median band. The hindwing tails are outlined in yellow. The undersides of the wings are yellow with brown markings and broad blue and rust colored median band. The Schaus swallowtail is superficially similar to the giant swallowtail, Papilio cresphontes Cramer, with which it frequently flies. The giant swallowtail is typically larger in size, has intersecting yellow forewing spot bands, and a yellow spot in the center of the hindwing tail. Eggs: The eggs are light or dark green and spherical. Figure 2. 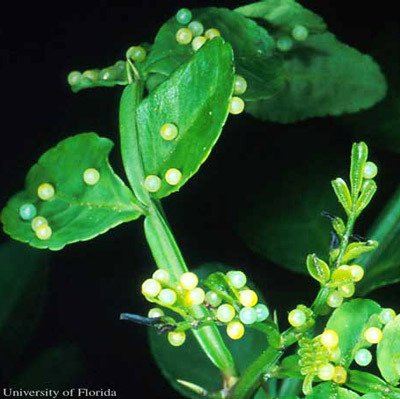 Eggs of the Schaus swallowtail, Heraclides aristodemus ponceanus (Schaus), on wild lime, Zanthoxylum fagara (L.) Sarg. (Rutaceae). Photograph by Jaret C. Daniels, University of Florida. Larvae: The mature larvae are brown with cream and yellow lateral patches, a white patch on the posterior end and several longitudinal rows of blue spots. Early instar larvae are predominately brown with a cream saddle and a white posterior patch. They resemble bird or lizard droppings. The osmeterium is white. Figure 3. Larva of the Schaus swallowtail, Heraclides aristodemus ponceanus (Schaus), on wild lime, Zanthoxylum fagara (L.) Sarg. (Rutaceae). Photograph by Jaret C. Daniels, University of Florida. Pupae: The compact pupae are brown with a bark-like pattern. They are attached to a twig or other substrate with a silken pad at the posterior and a silken girdle around the middle. The pupae overwinter. The Schaus swallowtail produces one generation each year from April to July, with the peak flight typically from mid-May to mid-June. 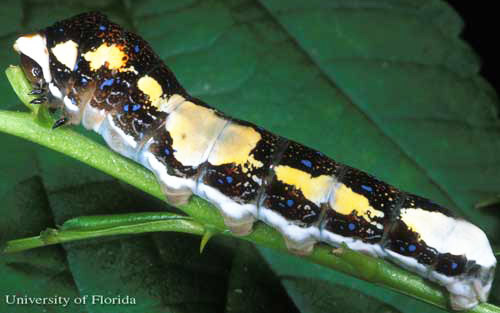 Adult emergence and reproduction is correlated with the beginning of the Florida rainy season but pupae may remain in diapause for more than one year if optimal weather conditions are not present. Compared to most swallowtails, the adults have a slow, leisurely flight and adeptly maneuver through the dense hardwood hammock vegetation. 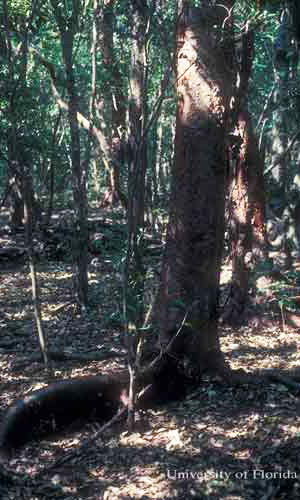 The females lay the green eggs singly on the new growth of wild lime, Zanthoxylum fagara (L.)Sarg. (Rutaceae) and sea torchwood, Amyris elemifera L. (Rutaceae). The developing larvae feed primarily on young foliage. Figure 4. Adult female Schaus swallowtail, Heraclides aristodemus ponceanus (Schaus), ovipositing on the new growth of wild lime, Zanthoxylum fagara (L.) Sarg. (Rutaceae). Photograph by Jaret C. Daniels, University of Florida. Figure 5. Tropical hardwood hammock habitat in Upper Florida Keys. Photograph by Jaret C. Daniels, University of Florida. The Schaus swallowtail is currently listed as an endangered species by the State of Florida and the United States Fish and Wildlife Service. Continued threats to the remaining population include the loss of genetic diversity due to inbreeding, climate-related impact (drought), habitat disturbance from fire, tropical storms or hurricanes, and potentially from mosquito-control adulticide drift. Daniels JC, Minni MC, Emmel TC, Eliazar PJ, Groce LL. 1993. Egg color dimprphism in the endangered Schaus swallowtail butterfly, Papilio aristodemus ponceanus, of South Florida (Lepidoptera: Papilionidae). Tropical Lepidoptera 4: 65-66. Klots AB. 1951. A Field Guide to the Butterflies of North America, East of the Great Plains. Houghton Mifflin, Boston. 349 pp. Publication Date: September 2006. Reviewed: December 2014.